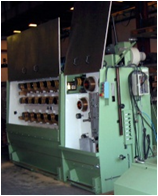 The TRE-21/4 drawing machine is a typical four wire tandem machine to draw thin copper wires of hight productivity and finishing quality. The independent drive permits (common for annealing furnace) a quick change of rows. By two C.A. engines with automatic ventilation and a frequency convertor and 84 Kw. ∅ 28 x 12 mm.